Hollywood Vampire will premiere on Tuesday, October 16th, 2018 with new episodes launching weekly until Tuesday, January 8th 2019 on tinyurl.com/hollywoodvampire. Hollywood Vampire is a comedic web show created by award winners Tom Cavanaugh (writer), Matt Ritchey (director), Bob Telford (director) and Allyson Sereboff under the production banner of their group, 8Aprons. A ‘twenty-something’ vampire is kicked out of his homeland. With no place to turn, he and his sidekick/Butler, Gilroy, trek to Hollywood to find the internet model/actress, dream girl who he’s he’s fallen madly in love with in Los Angeles. Their first encounter is classic Hollywood… just a stranger trying to hit on a model… but Hannah Beth soon discovers that Vlad is NOT just another bloodsucking schmoe in the Hollywood dating scene! The original script was created in workshop at the film collective, We Make Movies in Hollywood. That inspired Cavanaugh to seek out other artists that wanted to work in television or episodic story telling. Cavanaugh along with Matt Ritchey, Bob Telford and Allyson Sereboff, 8Aprons used their combined assets and skills, on a very limited budget, to create thirteen episodes plus a trailer. Tom Cavanaugh is best known for his questions from the audience on Inside The Actors Studio and in the L.A. Intimate Theater Community as the Producer/Director of the 2017 Hollywood Fringe Festival, Best Solo Performance, Under the Jello Mold. His first short film, The Shift won awards in several film festivals and received a five-star rating at the 2007 Short Film Corner at the Cannes Film Festival. Tom is also a two-time finalist at the New American Playwrights Program at the Utah Shakespeare Festival. Matt Ritchey is an L.A. based film and theater director whose short film Poker Night won Best Comedy at the Culver City Film Festival, and whose stage productions of Angel’s Flight won Best Cabaret and American Conspiracy won Encore Producer’s Award at the Hollywood Fringe Festival. He was nominated for Best Director for both shows. He’s an NYU and RADA educated actor, writer, and editor currently wrapping up Post-Production on the short film Purple Flowers and the web series. Bob Telford is an award-winning actor/director. He has spent the last 38 years working in theater, commercials, TV & Film. From 1989 to 2006 Bob had his own production company, producing and directing over 200 projects for clients including The Academy of Television Arts & Sciences. His TV credits include Parks and Recreation, Roseanne, Reasonable Doubts, and Young & The Restless. Film credits include The Best of The Best, Riding With James Dean, Wild Horses & Butterfly Caught. Recent credits include Bob recently completed the Japanese adventure series, Fujiyama Ichiban, which can seen on YouTube, the A&E series Fall Into Me and HBO Greenlight’s Pineapple. Allyson Sereboff is a Baltimore, M.D. native. Allyson studied acting at The William Esper Studio, New York City and had her first feature film debut in Troma’s Poultrygeist: Night of the Chicken Dead. Allyson also appeared in and assisted on the Speechless Without Writer’s campaign during the subsequent writer’s strike in Los Angeles. 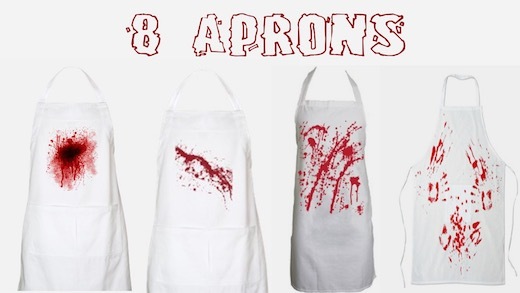 She is a member of We Make Movies and has teamed up to launch 8 Aprons, currently in multiple productions.